The location for stowing a folded triangle or its box is under the front seat. Before leaving your vehicle to set up and install the triangle, put on your high visibility vest. - C: width = 38 mm. To use the triangle, refer to the manufacturer's instructions. 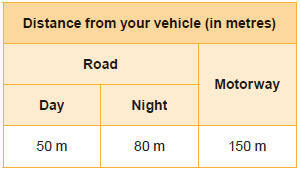 Place the triangle at a distance behind the vehicle, as shown in the table below, according to the type of road and the level of ambient light. These are the internationally recognised values. Use the triangle in line with local driving regulations. 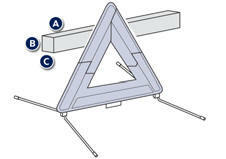 The triangle is available as an accessory, contact a PEUGEOT dealer or a qualified workshop.